This charming little bookworm will win your heart as well as the teachers! 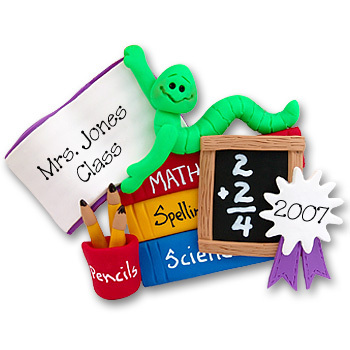 It has plenty of room for personalization and makes a great gift from the class or the school. He comes complete with a hook and satin ribbon for hanging. This ornament is handmade from polymer clay and designed by Debi Allison.